You guys… they’re back! The Apple MMEF2AM/A AirPods Wireless Bluetooth Headset mysteriously went on sale last week on Amazon, which pretty much never happens. Heck, Apple still can’t even deliver new orders in under a week. 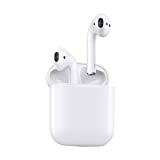 Well, if you missed out on the action last week, you’ll be happy to learn that AirPods are now back in stock on Amazon, and they’re back down to their sale price of $144.98. Discounts on AirPods are extremely rare so get in on the action while you can!